Rather than do the the complete 12 Days of Christmas for my tablescape, I chose one of my favorite parts of the song. The seventh day. Swans swimming. I love to watch them glide in the water moving their graceful necks and the gentle movement of wings. I think my love of movement in Ballet helps me to love Swans so much. So graceful. 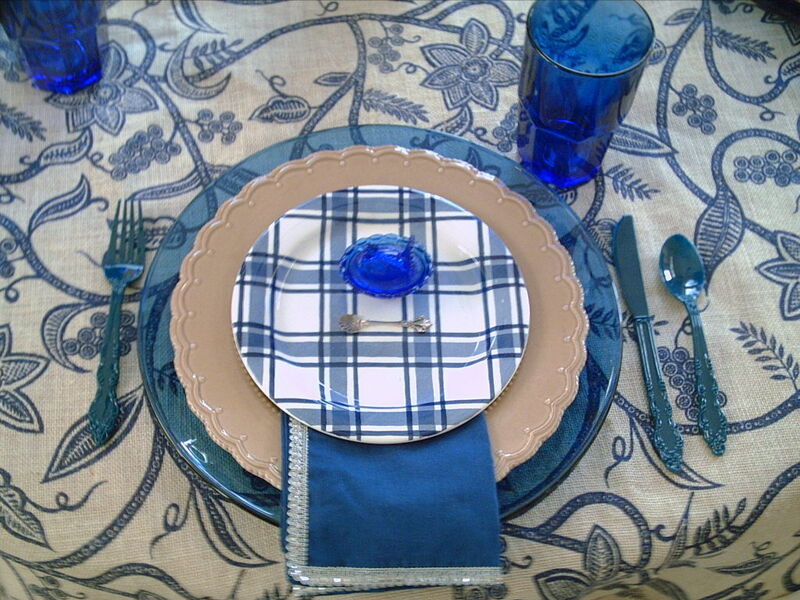 I have tried to bring grace to this tablescape. 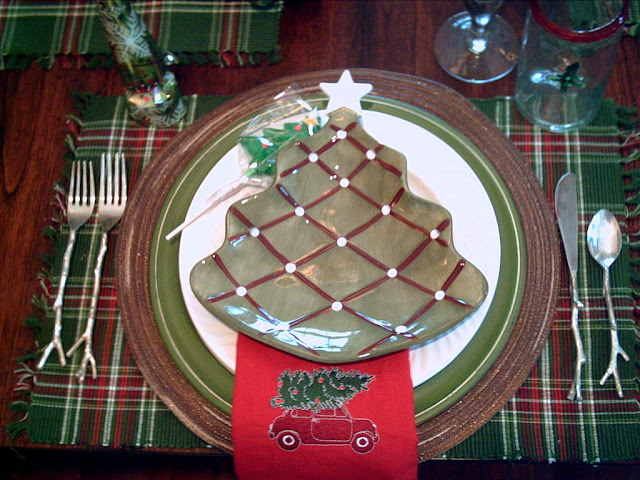 Did you ever go out with your old station wagon or old truck to cut down your family Christmas Tree? As a child, before my parent's bought the silvered aluminum tree with a spinning color wheel that my Mom so loved. We would go out to the snow-capped mountains to cut down our treasured tree. 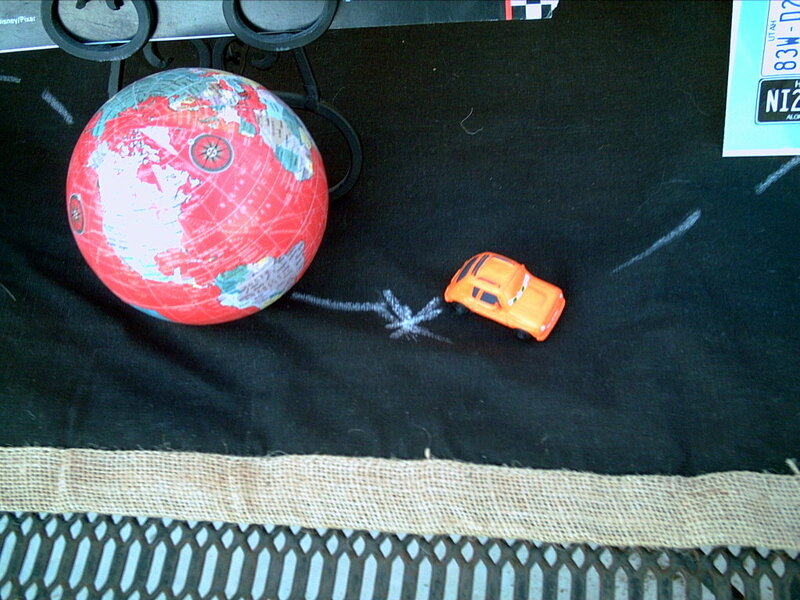 Believe it or not, sometimes we would put one atop our Beetle Volkswagen. 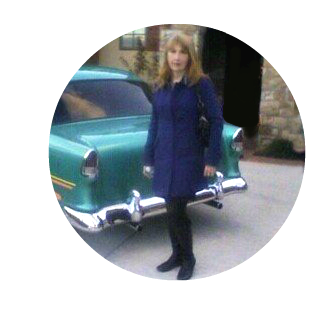 My Dad loved cars and was always buying new cars, much to my Mother's chagrin. He preferred Fords or Volkswagens. In his lifetime he bought 11 Volkswagens. Nine of the Bug or Beetle style, one called a "Squareback" which looked like a small station wagon, and the one I loved the most, a green and beige Camper Van. 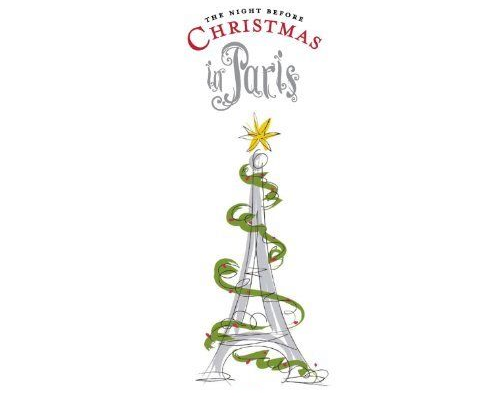 That one gives me the best memory of driving down the road with a Christmas tree tied on the top. 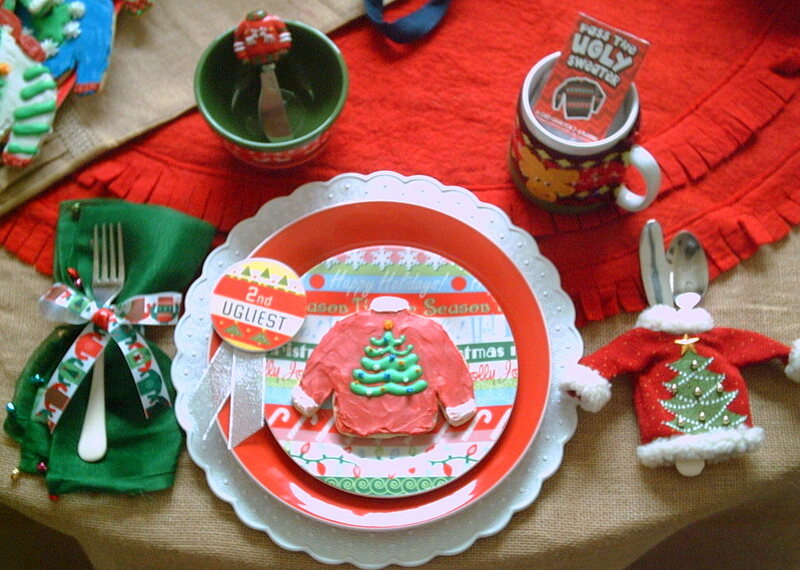 You know what I think... You could not find a more fun theme for a Holiday Party. Such crazy fun with these Ugly Sweaters. I actually think they are so adorable! Two of my University age Grandson's from different parents and one girlfriend stopped by last night. They had so much fun seeing this table. We laughed and laughed. That was worth everything to me. Done in memory of the sweaters I wore in the '90's while volunteering at one of my girl's schools. We all wore them and thought they were so cool. As usual I like to include a fun little party favor. 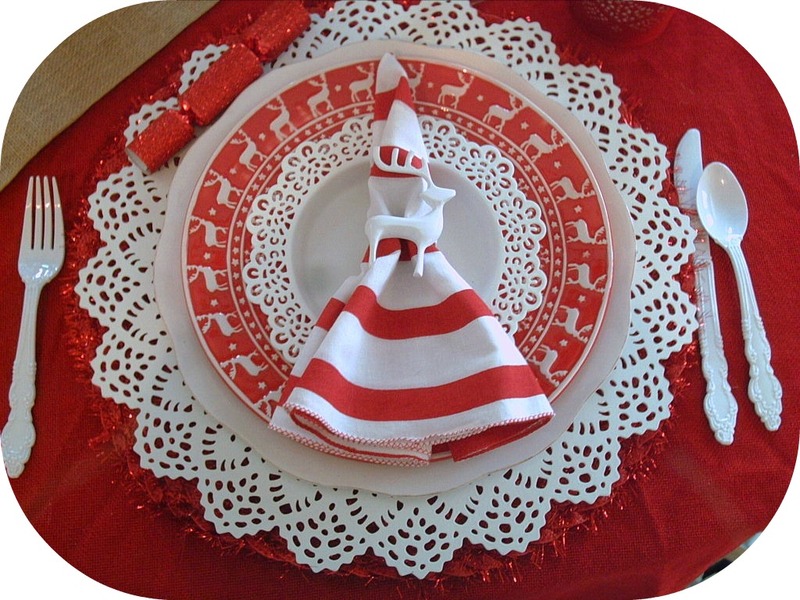 My favorite a red sparkled Christmas Cracker. 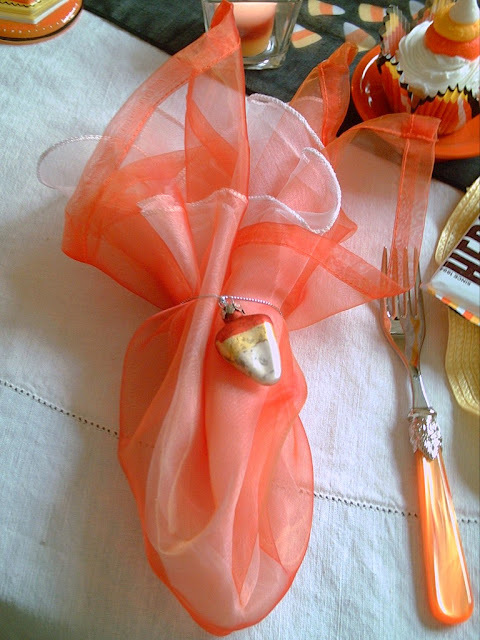 Filled with a paper crown, joke or riddle, and a small prize. I am always astounded how excited everyone gets when they hear the pop noise and grab for the prizes popping out. There is always a scream of joy. Adults and children alike. 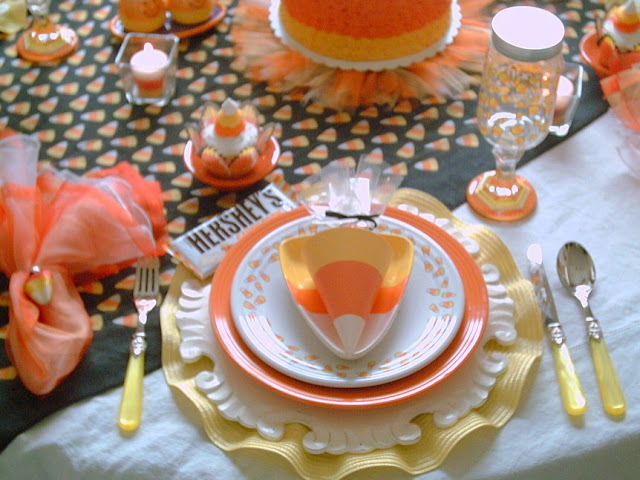 This table will be for the Teens to sit and enjoy their Thanksgiving meal. 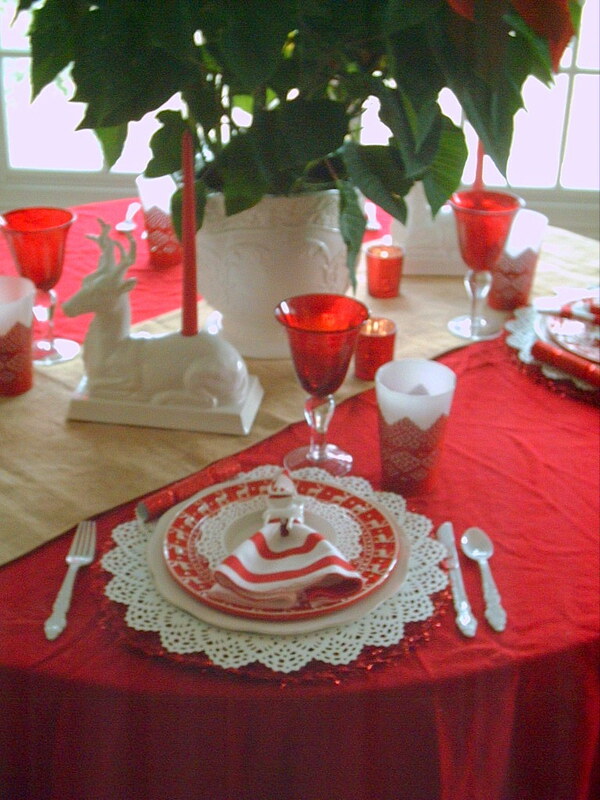 I love to mix things up a bit and use non-traditional Holiday colors sometimes. 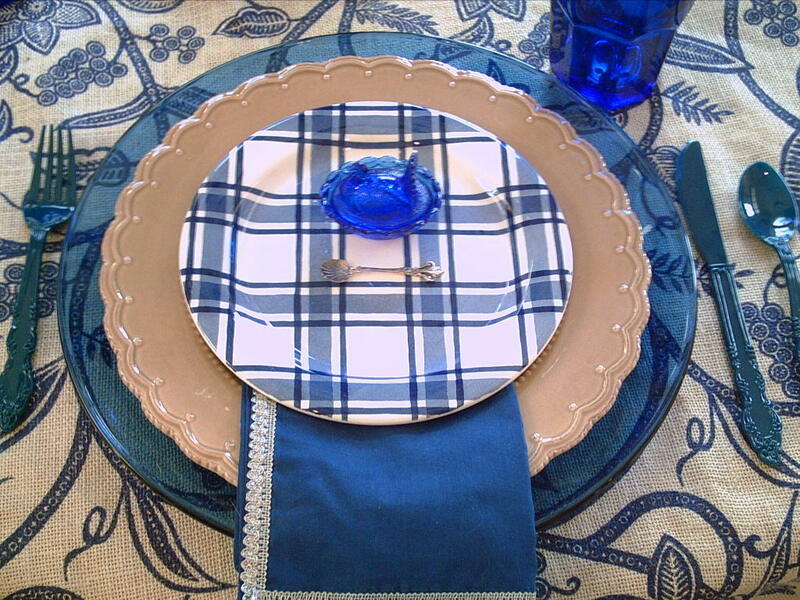 Inspired by the Cobalt blue little salt cellar Turkeys' and blue plaid plates. 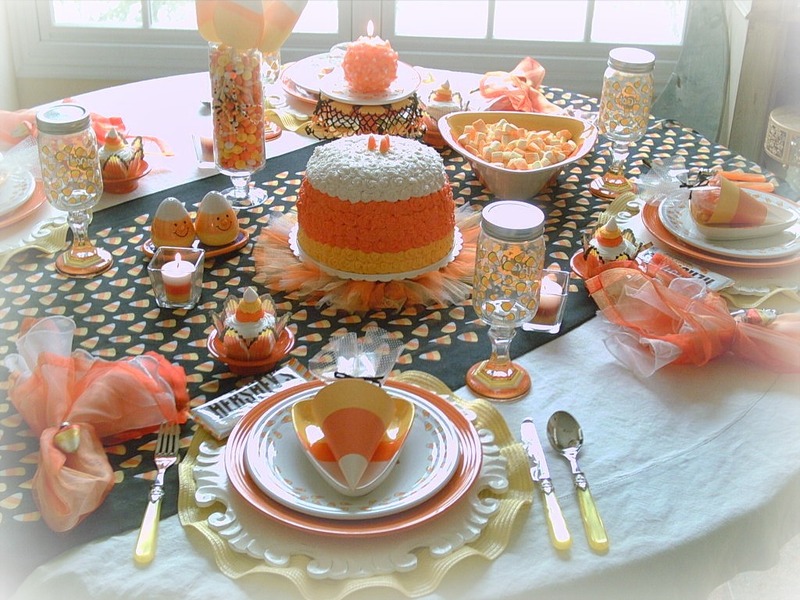 I have had this table planned for some time. Come on over and have a good time. 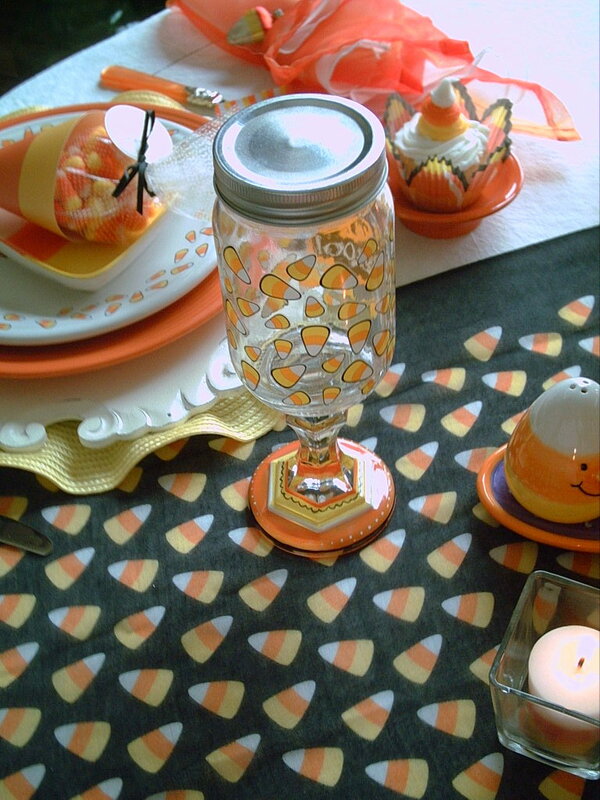 I didn't want this to be a Halloween tablescape, but a Fall "scape". The Food Network said Candy Corn is the Nation's favorite Fall treat. Do you agree? One more BEAUTIFUL cake made for my by my Dear friend Deanne Taylor from a town called Pleasant Grove. An apt name for a town with such a wonderful friend living there. 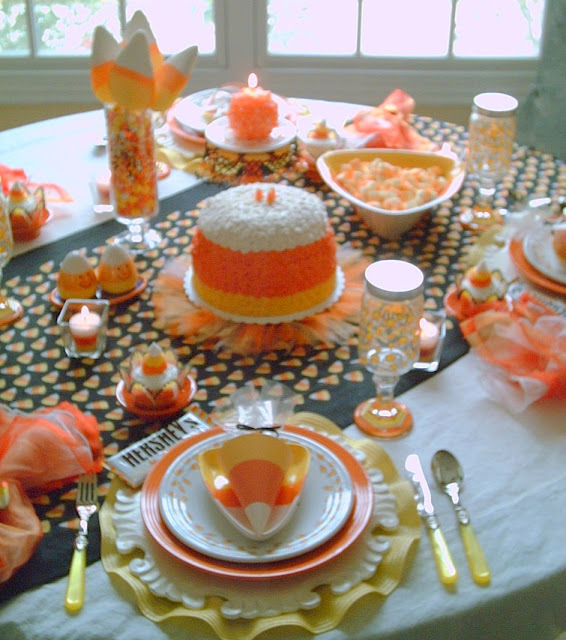 She has made other cakes for my Blog's. My Cinderella Tablescape and Ghost Witch Tablescape. 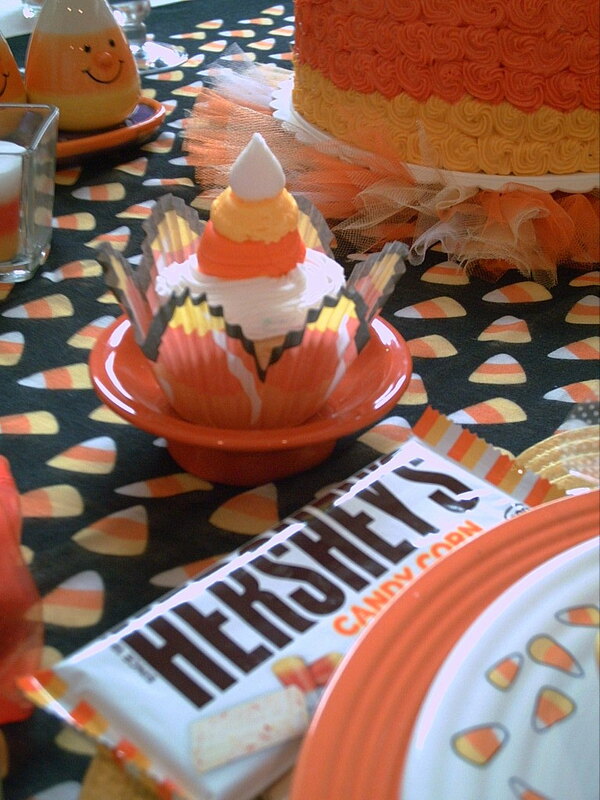 Even Hershey's got into the act. A Candy Corn Hershey bar. 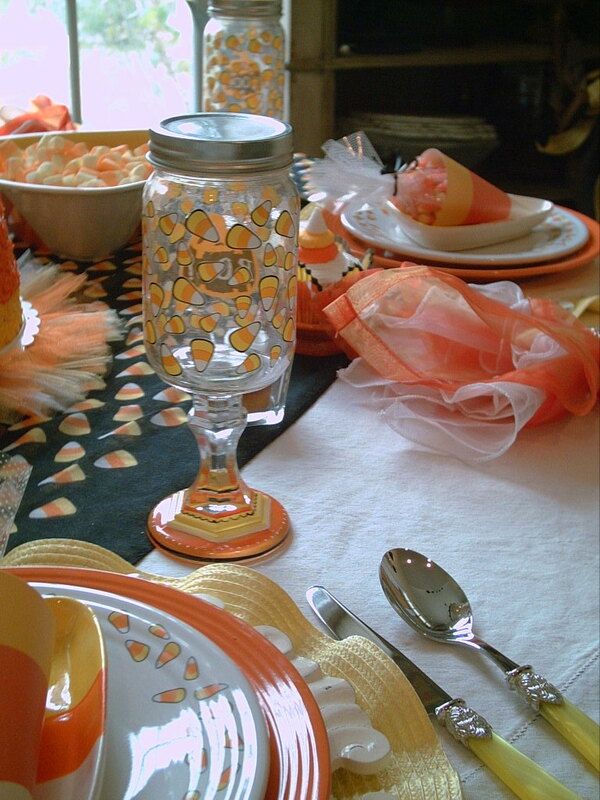 Candy Corn glasses I found at the Grocery store last year. 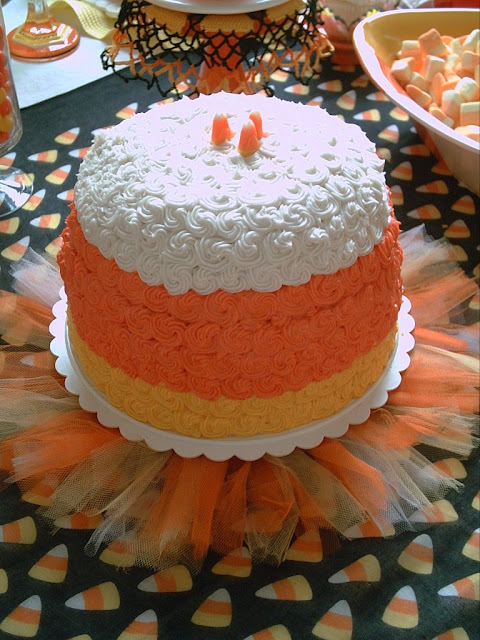 Guess what I put under the cake? A toddler size candy corn colored Tutu! 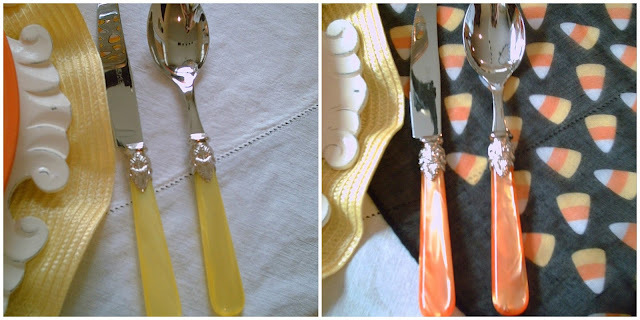 I decided to use both yellow and orange flatware. 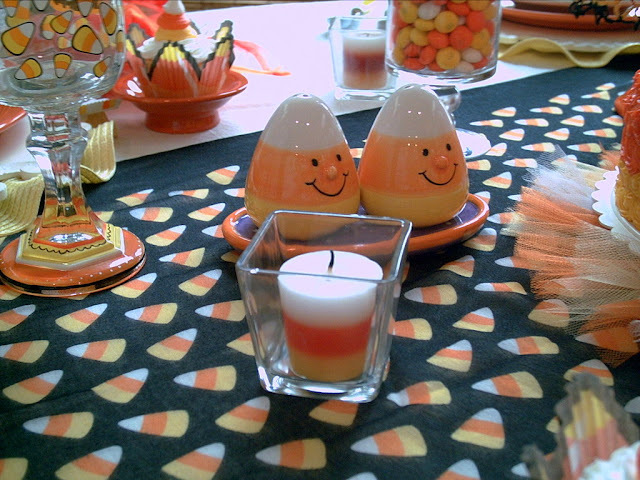 I used some small Candy Corn ornaments for my napkin rings. Purchased from my favorite Pharmacy/gift/floral shop. 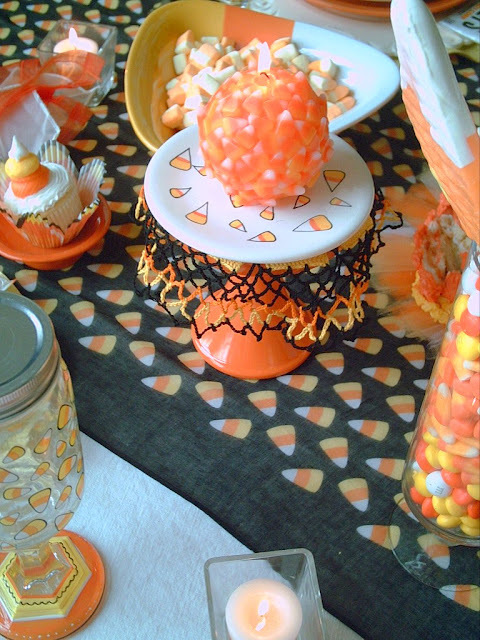 The candy jar is filled with hard sugar suckers and of course Candy Corn. 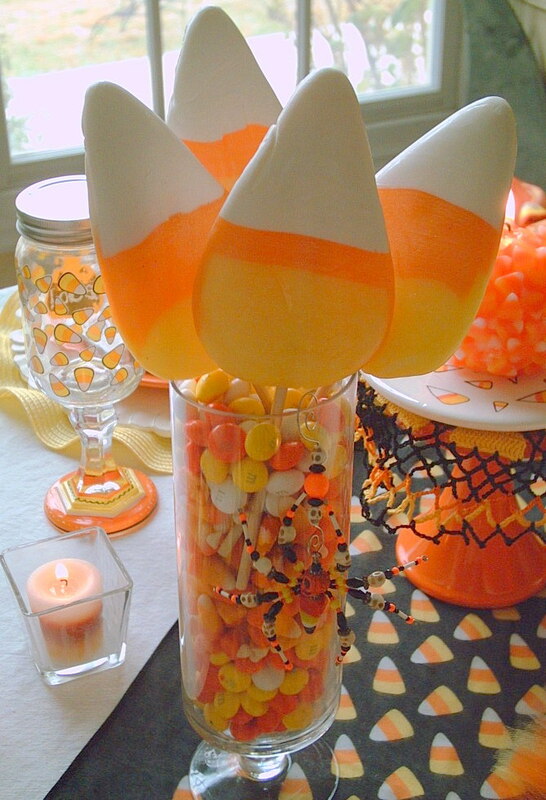 My favorite is the M & M 's, their Candy Corn flavor is really quite good. 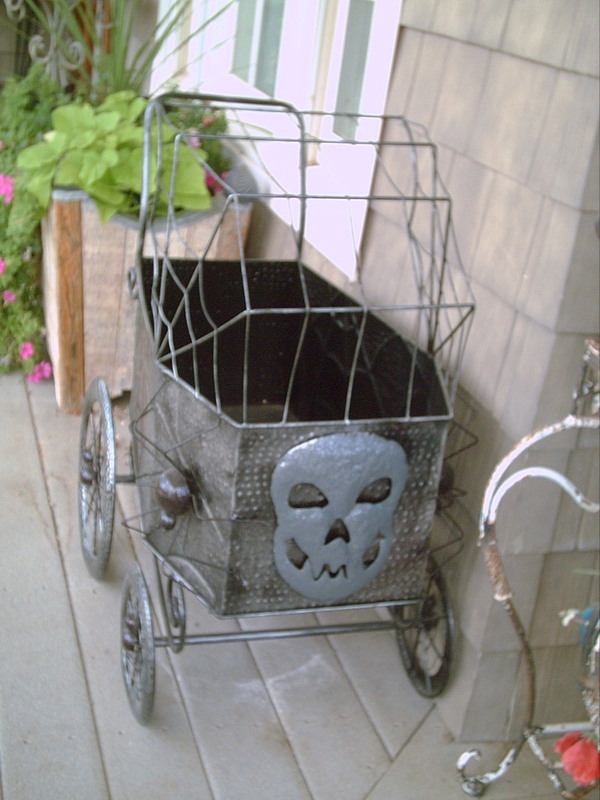 One item that could be considered Halloween. 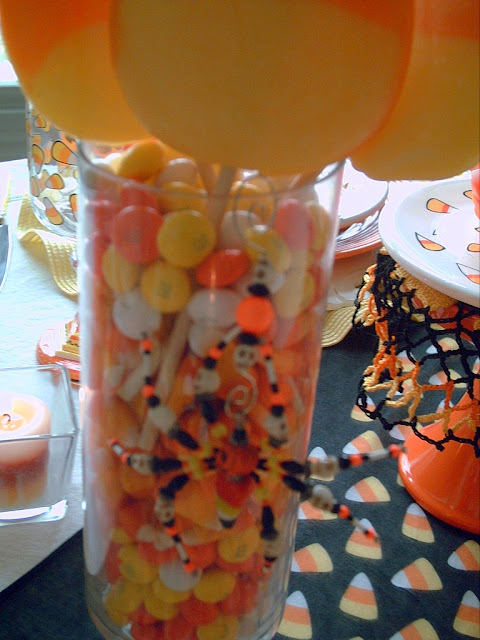 A Candy Corn jeweled spider hanging from the candy jar. Today we woke up to snow. Our first snowfall. 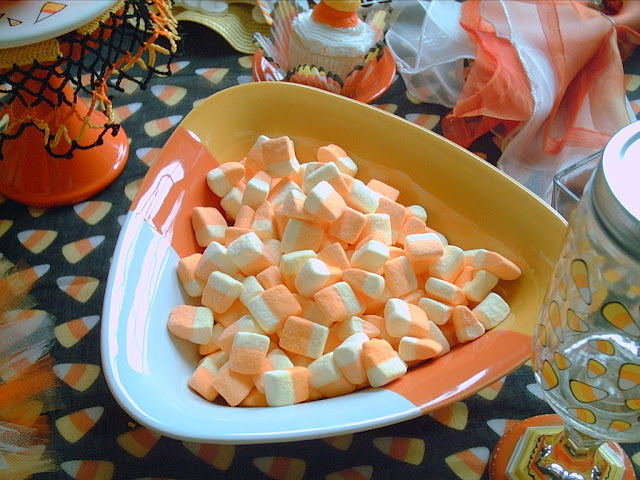 So we decided to add some Candy Corn marshmallows. We are going to have some hot chocolate! Thanks for looking! Feel free to leave a comment. 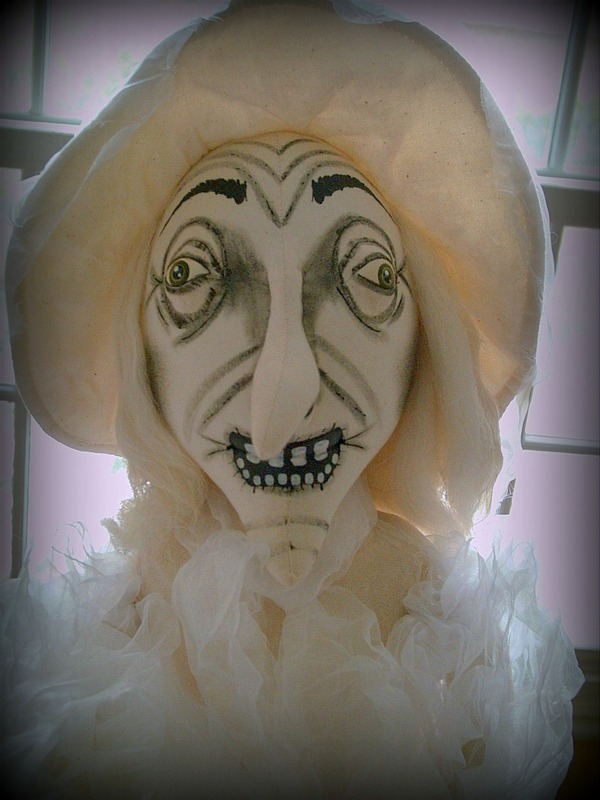 Agatha is now a ghost, but still a witch. She is still wearing her hat and hoping. Poor thing. 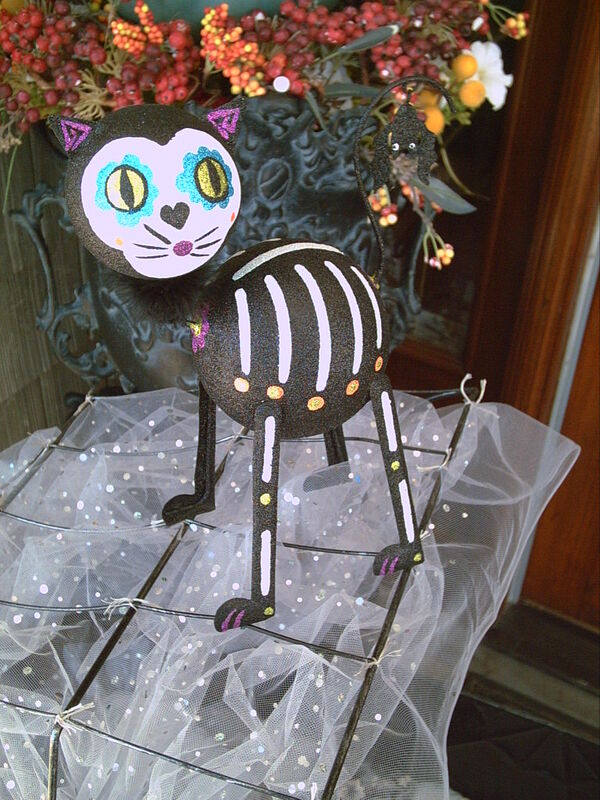 In the graveyard the spirits are restless, this is their happy time. 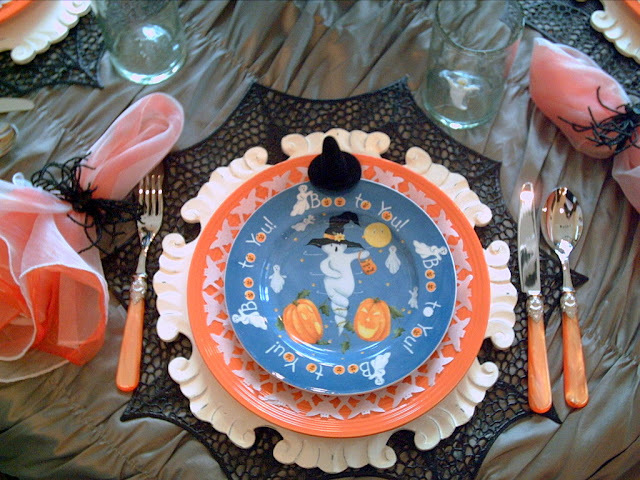 Frankenstein Tablescape Trick or Treat, Treat, Treat. Welcome to a Trick or Treat Frankenstein Tablescape. He couldn't wait to start in on the candy. So happy he is. His favorite night of the year. He is all dressed up in his finest. Guess who he is going as? Right! 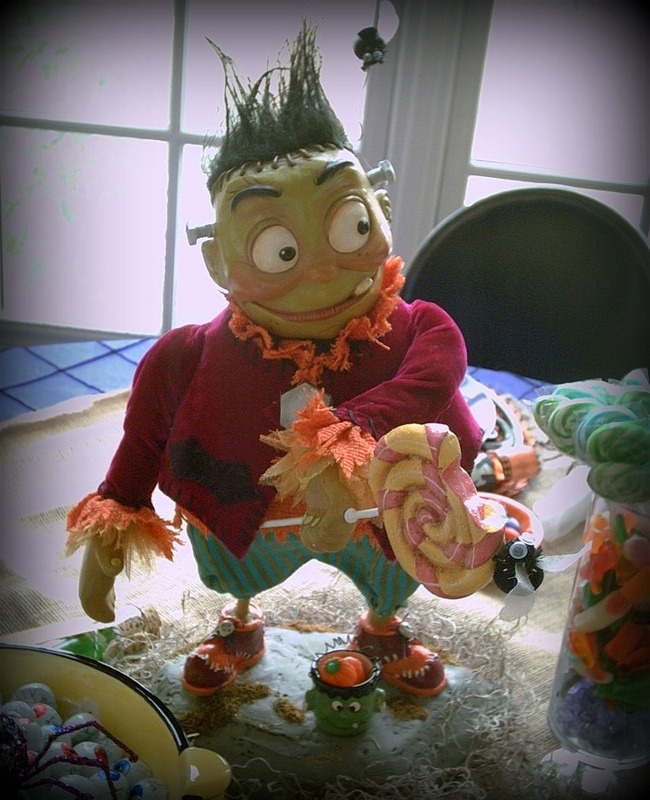 Frankenstein! Ready for your fortune to be told? This mystic lady would love you to sit down to learn of your Fate. 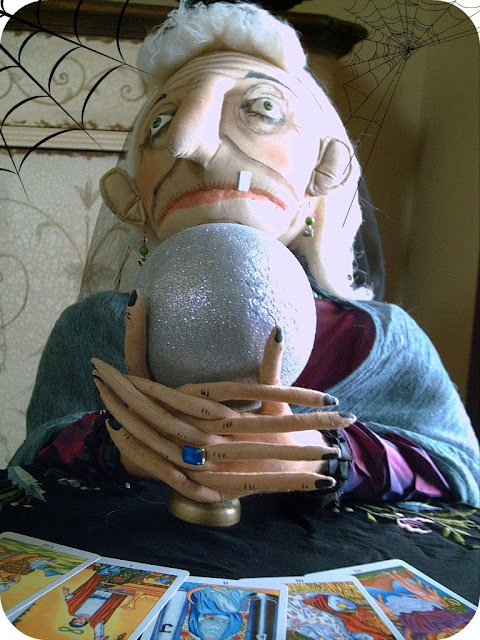 Gaze into the Crystal Ball... Have your cards read... Read your palm... All in good fun. When I was a girl of about 11, Halloween was still so much fun. That year all the neighborhood "kids" said there is a very special house you have to see. I was told a "rich" banker and his wife lived in this house. Well of course, we were all curious. As I was saying... 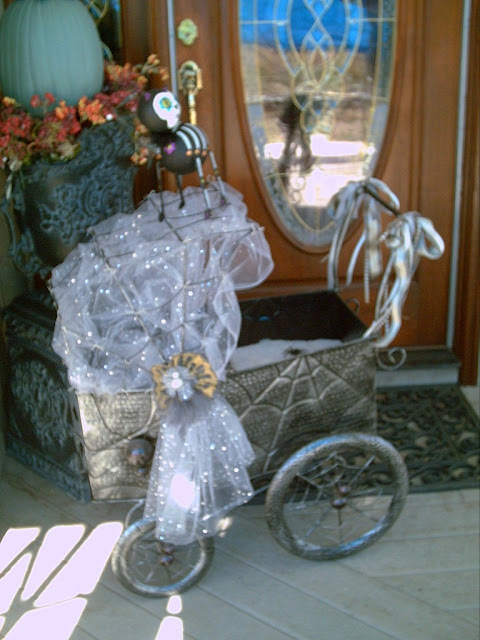 Going into the store, right at the front, was this gorgeous carriage. I audibly gasped. I kept walking past it knowing that my husband was about ten steps behind me. He came to the store with me to offer his emotional support or was it to subtly encourage me to buy nothing, as I was just going to look. Instead I heard him call my name, "Val!" "Val!". I turned and he said, "did you see this carriage!" I started to laugh and said "of course". Spooky & creepy. Only go out if you dare. What's not to love about the magic of the moon. 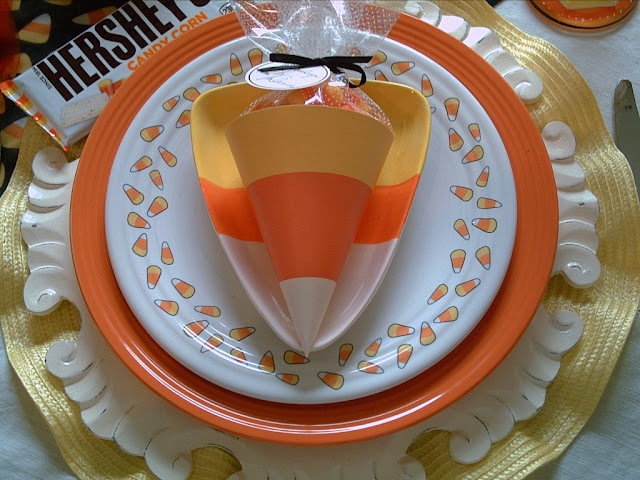 I didn't buy anything new for this tablescape, only the candy and Moon Pies of course. I just pulled items from what I have. I was surprised in what I found that reminded me of a moonlit night. Are We There Yet? 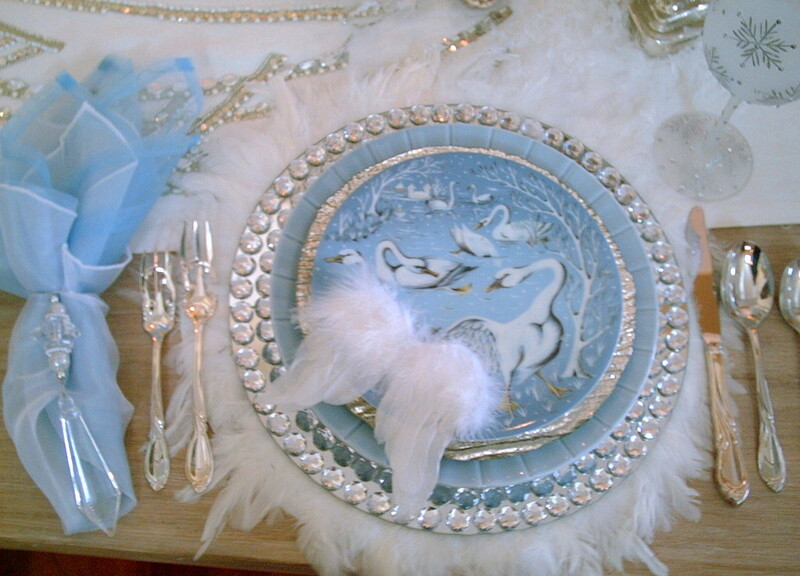 Tablescape. 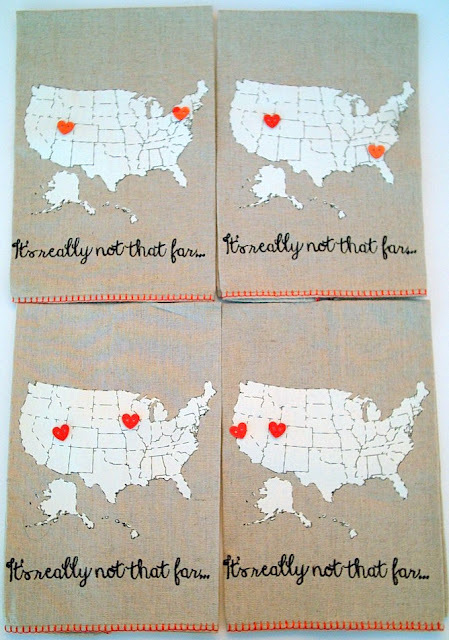 Road Trip... Blog Anniversary Giveaway. It's really not that far! So say my napkins. Before I really get into the tablescape photos. I want to express how much I love this Country. I have traveled all over the place (U.S.). I have children that live on the East Coast, The South, The Midwest, The West Coast. We travel by car or truck, etc.. and I love it! I hate to fly as my ears hurt for days & I always get sick. So we drive. When you drive you see amazing, amazing things and places you would never see by flying to your destination. Each small town that you don't see from the road has something charming and wonderful. For instance when driving through Pennsylvania and Tennessee it was so lush and green you could see nothing from the Freeway. It was taking a chance to explore by taking an exit off the Freeway and being surprised and then finding some magical places. Upstate New York, the gorgeous lakes. Niagara Falls and riding on the "Maid of the Mist", I never laughed so hard, the ride was exhilarating. Blueberries as big as large grapes. Little farm stands with homemade pies each day. Parking our car in New York City for a week and exploring on foot, subway, or taxi. We ate and ate. This was the place to lose weight as I lost 5 pounds by walking. Florida, eating the delicious Key Lime Pies and Key Lime Cake. Coconut Cake as well. This place had the opposite effect on weight. To this day I say it was well worth the five pounds I gained there. I have no regrets. North Carolina was a highlight to see the Biltmore. Let me tell you, that is one gorgeous state. Georgia to visit one of our twin sons. It was a surprise to drive into Georgia and see the Welcome signs. The signs had a Peach and musical notes of the song "Georgia on My Mind". Hoagy Carmichael who wrote the music to that song is a distant cousin of my husband. So that was a thrill for him to see these signs. Louisiana, we put the GPS for the shortest distance. Not the quickest! We ended up on an old plantation. Couldn't see anything for miles. It seemed like time stood still and we had stepped back in time 150 years. Amazing. The charm of the Midwest. Cornfields, wheat fields, Antiques. Texas is another incredible place for antiques. My husband and I built our own house. What we couldn't do we hired others to do. Well the plans for the house came from an architect in Austin, Texas. We went to visit our son and daughter in law who happened to live there at the time. We realized our architect lived close to them and had a question about building that was rather important. We never had been able to reach him before. So we saw him and got everything explained. Great luck or divine intervention! The Alamo was a Spiritual experience for me. I don't know why but you could feel the essence of something like Peace. Drive through California. What a rich and diverse place. From towns that are super glamorous to quaint. Victorian towns. German towns. Each with incredible beauty and charm. 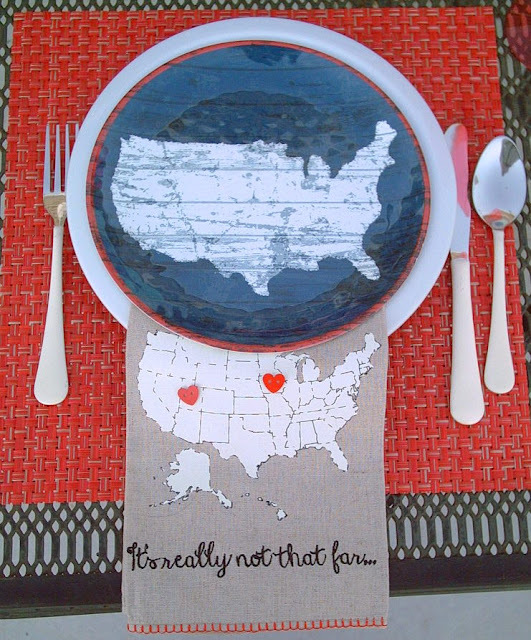 Sorry if I didn't mention your State, they all are unique and beautiful. 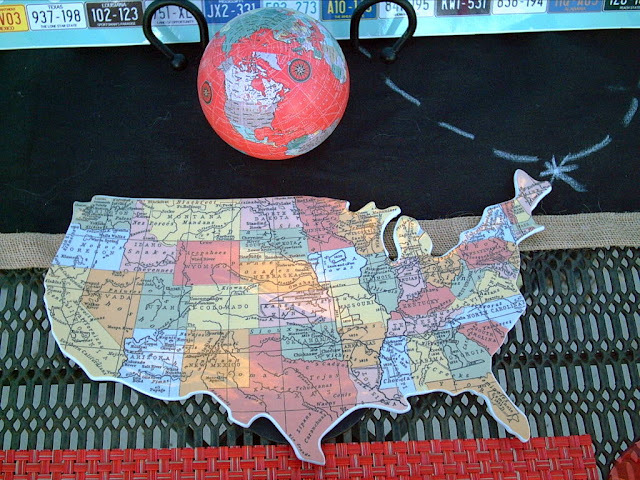 I have been to most of the States and have been totally thrilled to learn the history of each. I haven't even named my 2 favorite states! I love hometown Bakeries. I used to think of writing a book about traveling to different Bakeries and their specialties. Describing their uniqueness. So everywhere we go, we have to try all the bakeries. You know, you don't have to eat the whole thing as I did in Florida. I have to admit we are marathon drivers. A couple of years ago we left Florida at noon on Monday. Made it home Tuesday night at 10:00 p.m.. A distance of 2,100. miles. I would not recommend it, but somehow we (my husband and I) just kept talking (I call it yakking) and went through state after state and never got tired and just kept driving. We were entertained by the lady of " the Garmin". Also we listened to the radio show, Coast to Coast A.M.. I think they were talking about U.F.O. 's that night. I said to my hubby, just in case..., "don't look up"! You know, that could be a good title for a Tablescape! Porcelain tidbit/cheese U.S. map plate from Rosanna. The adorable napkins that you can move the heart buttons to your starting destination and ending destination are from Mud Pie. 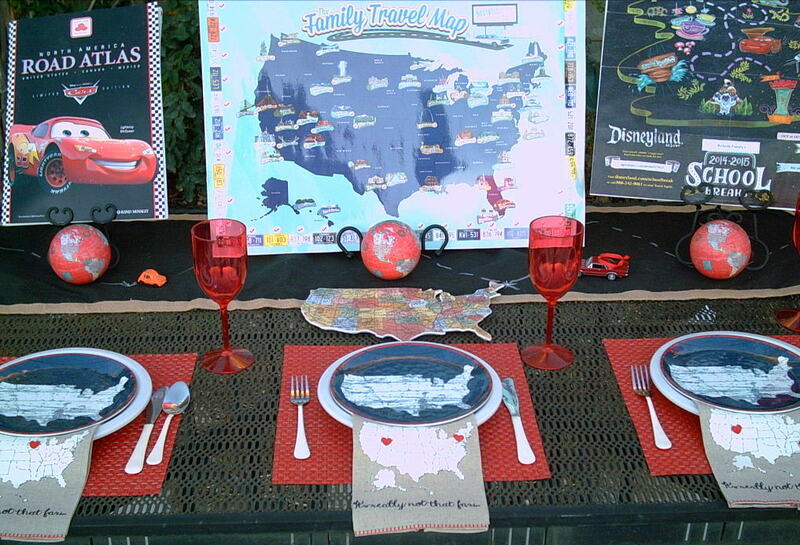 I purchased them last year and also the Family Travel Map from a floral/gift shop called Bloomingsales. I love this map. It comes laminated and you can place the large check marks around the border to show which states you have been. 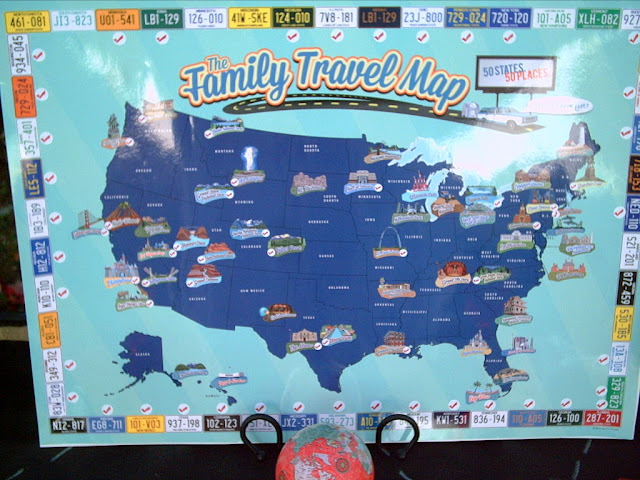 The smaller adhesive backed checks are to place on the U.S. map to some landmarks you have visited. A fun family project! 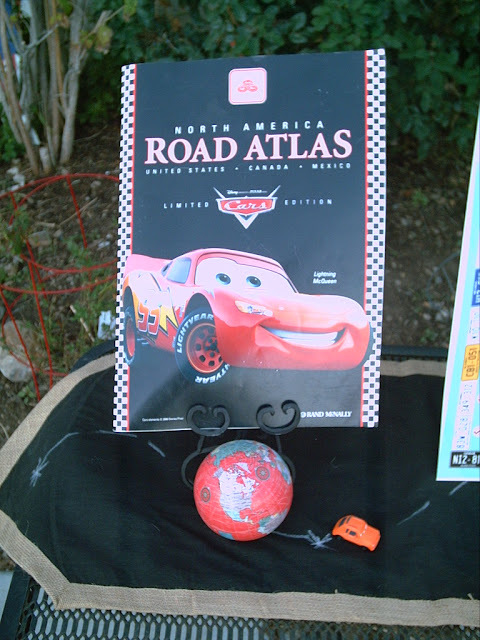 Red globes from Home Goods. With the United States showing. 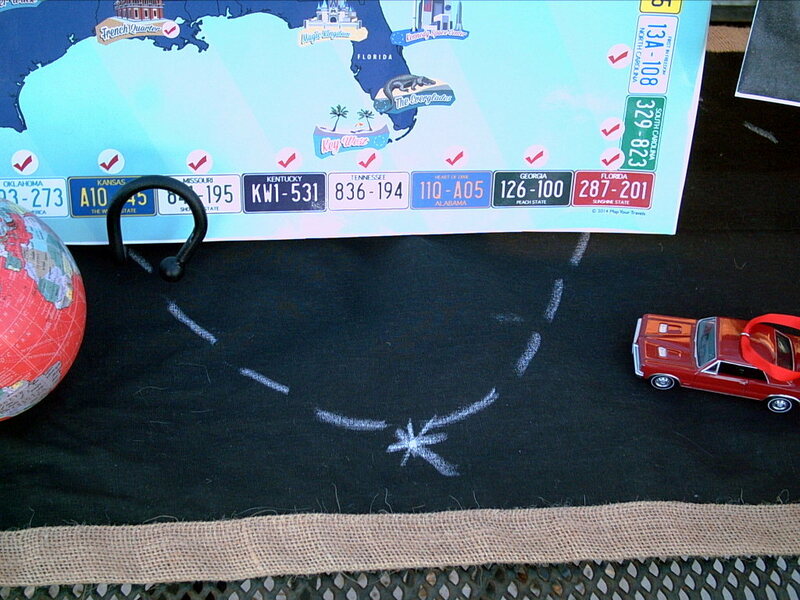 X marks the spot on this chalkboard paint table runner. From Mud Pie as well. 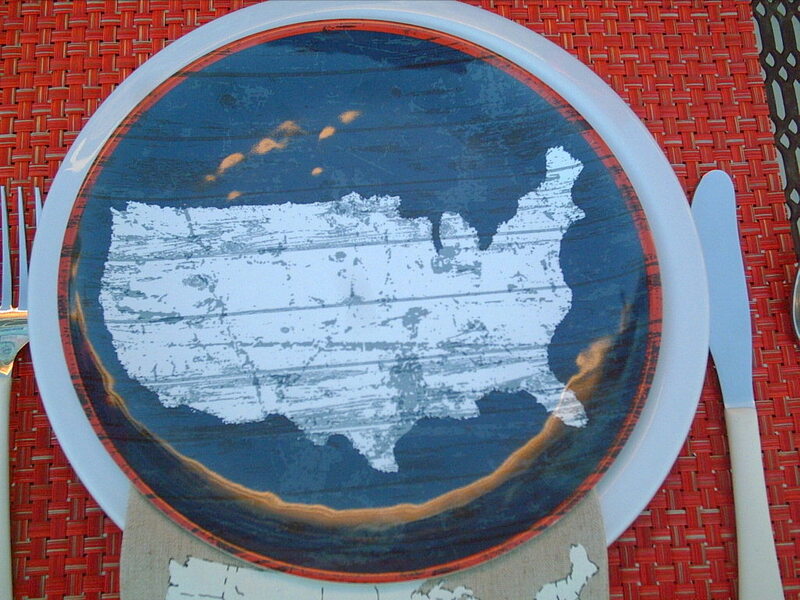 I love the U.S. plates from Pottery Barn. They were available last summer for the 4th of July. 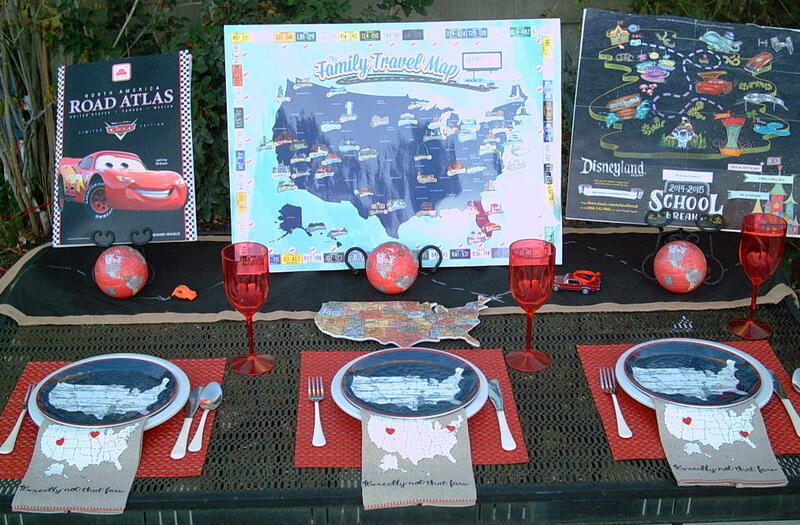 I bought them not for the 4th but with my Road Trip Tablescape in mind. The WINNER WAS LADY OF THE MANOR. CONGRATULATIONS! 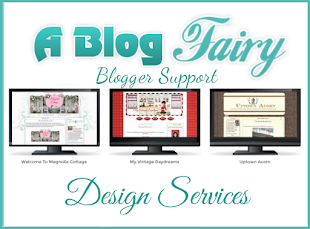 To celebrate and commemorate my 1st Blog year anniversary. I am going to be giving away a small gift. One that I thought would fit the Halloween season. 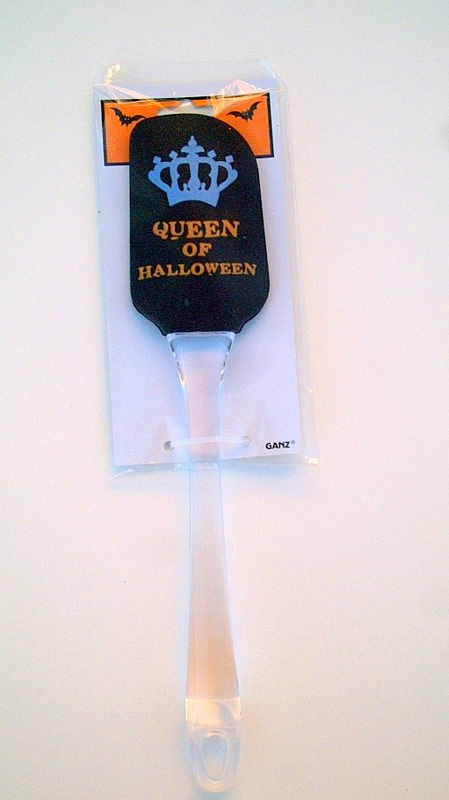 A "Queen of Halloween" spatula. I have only seen this one at one store so I purchased it. 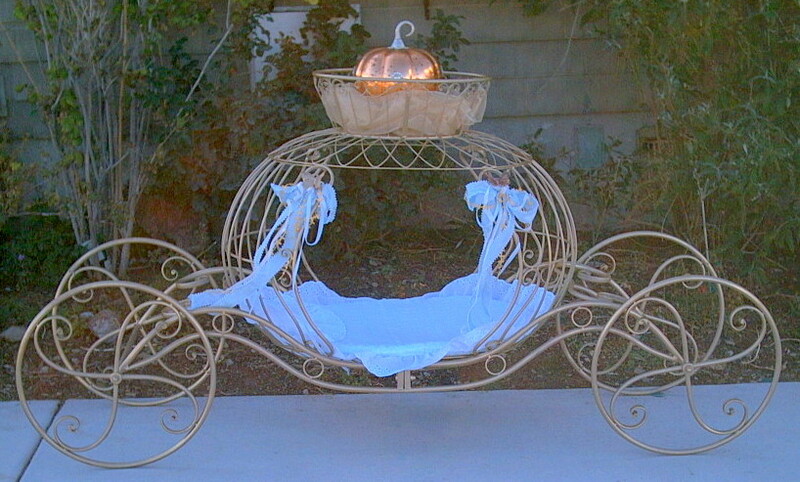 If you leave a comment you will have a chance to win this adorable item. This will be done by random draw. 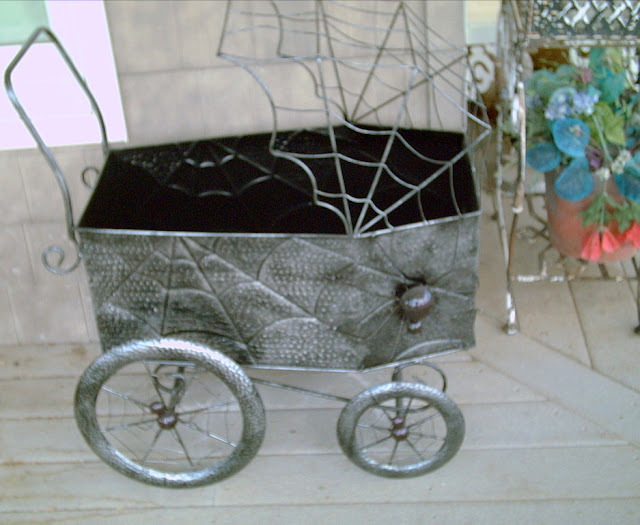 If you have a blog address that I can reach you at I will get your shipping info. If your comment is anonymous, please leave your email address and maybe your name on the comment, so I can contact you if you win. I will leave the contest open for 7 days from the start of this post. Good luck! Don't forget to leave a comment! I will be posting this Blog Post at Between Naps on the Porch for Tablescape Thursday. Please feel free to love a comment below. I love comments! Also you can pin my photos to Pinterest. Ghostly apparition in the window. I just happened to wander into a T. J. Maxx last year. One that I never go to. I found this adorable creepy buggy/carriage. Made from metal with 3-dimensional spiders and a skull head. Shaped like a coffin for a spooky effect. I loaded it with pumpkins and placed it on my porch for Halloween 2014. 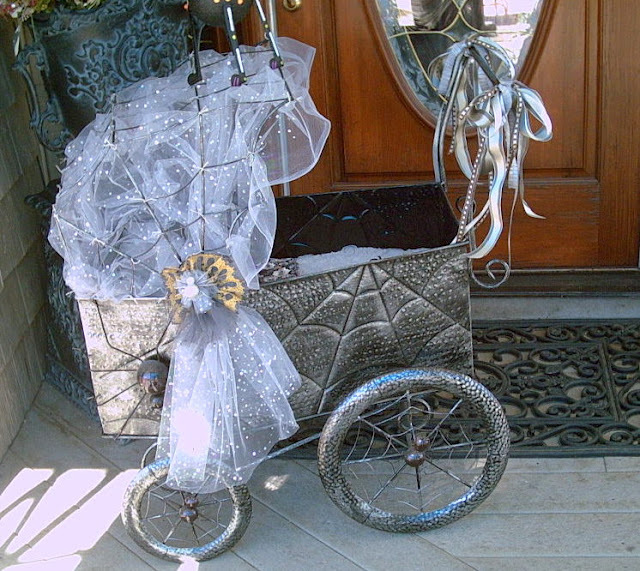 I really liked it for a Halloween display. I first started with the hood. 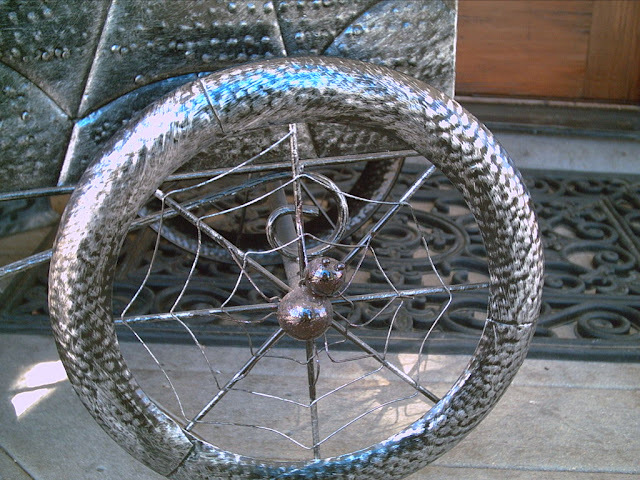 The metal is in a spiderweb pattern. I attached some gray tulle with metallic silver dots to the underneath side with some gray embroidery floss. 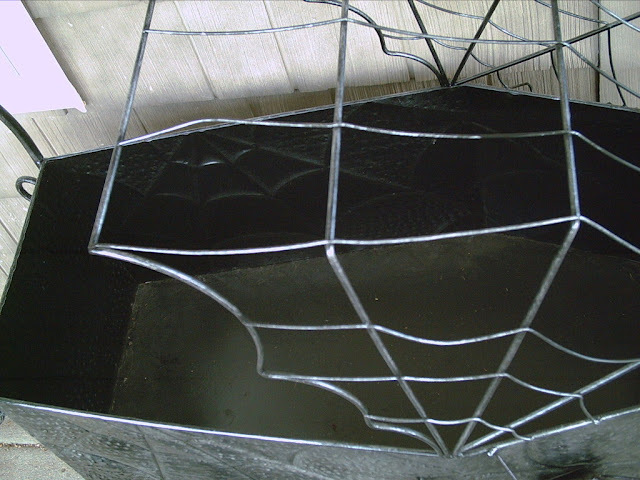 I did this to the underside so the great spiderweb detail could be seen and not obscured. I thought the floss looked spidery. Mainly I wanted the metal to show the curved edges of the spiderweb design. 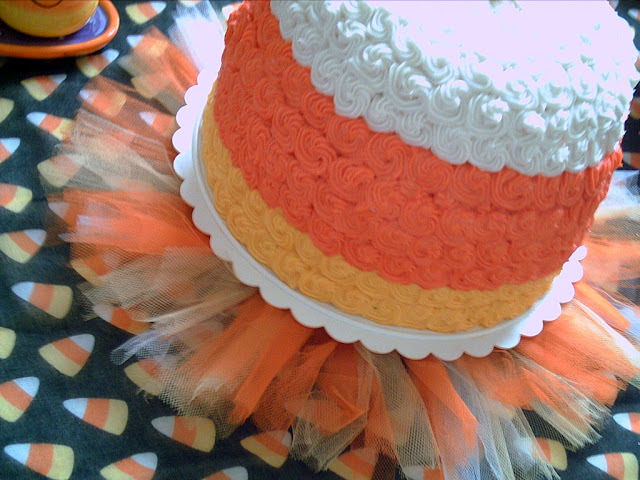 I left a little ruffle on the edge. 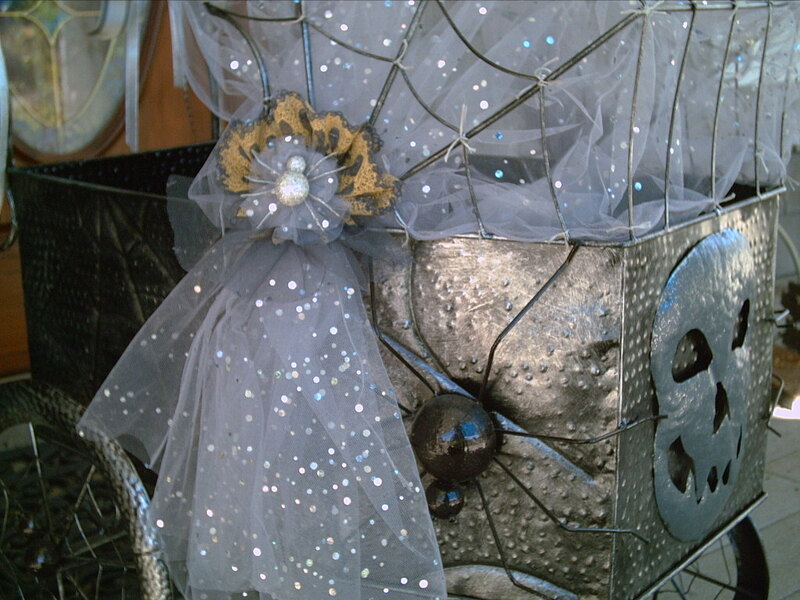 I then gathered the tulle on the side of the hood and attached some decoration. 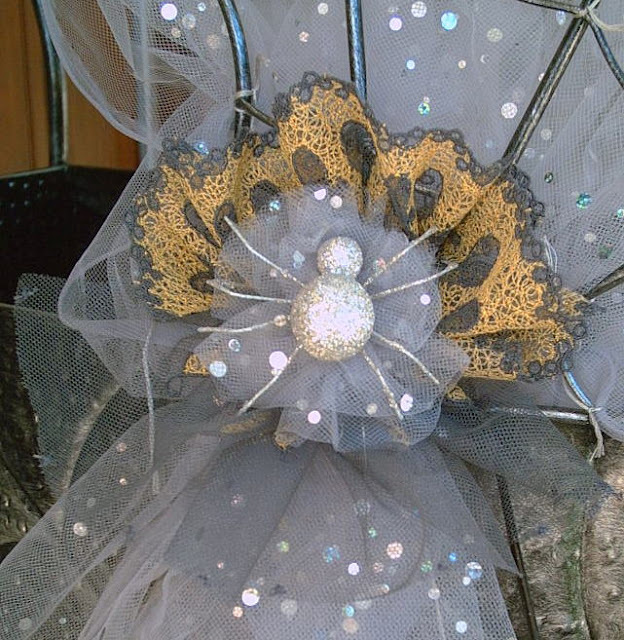 To make the decorative poufs I gathered up some gray and gold tulle lace trim by pleating it down the center. I then made some gray and silver tulle roses. I did this by folding in half length-wise and gathering the rough edge. Pulled it tight which made the tulle look like a flower. I attached the 2 pouf's together with a needle and thread. 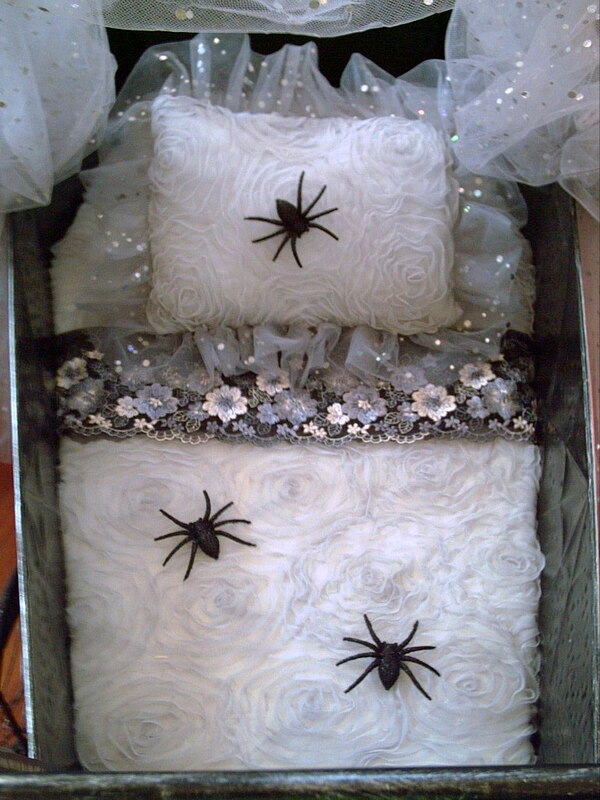 Of course I had to add some silver glittered spiders on top. 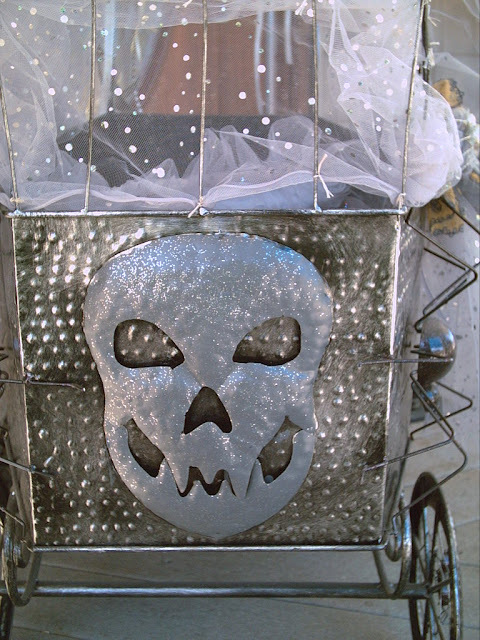 I attached them with hot glue to the buggy hood. For a mattress I used 2 layers of 3" foam for a total of 6". I covered the mattress with gray rose ribbon tulle fabric. 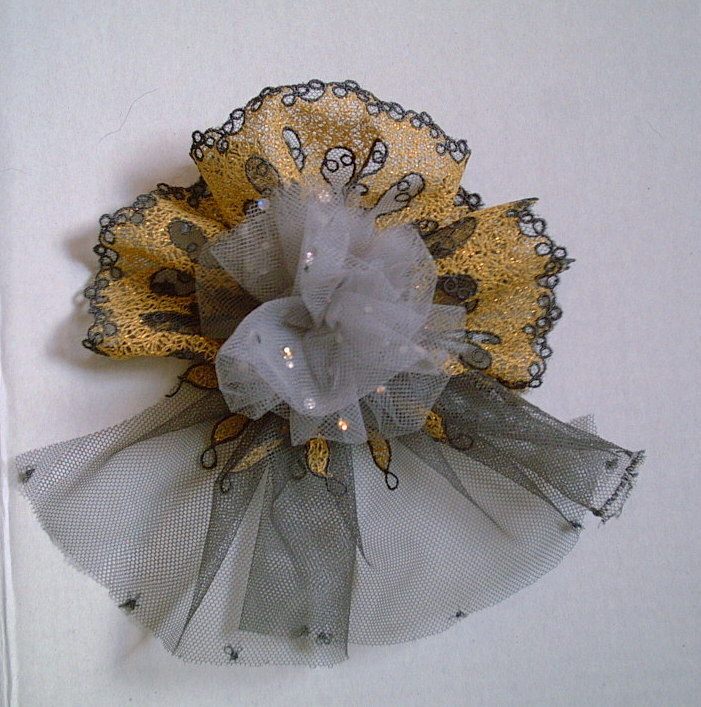 This gathered rose fabric is not organza like most fabrics of this style. Instead it is made from tulle. I laid a band of black and silver trim across to look like a fancy fold-down edge of a blanket. For a little creepiness I added 2 black glittered spiders on top of the bed. I also made a matching pillow from the ribbon rose fabric. 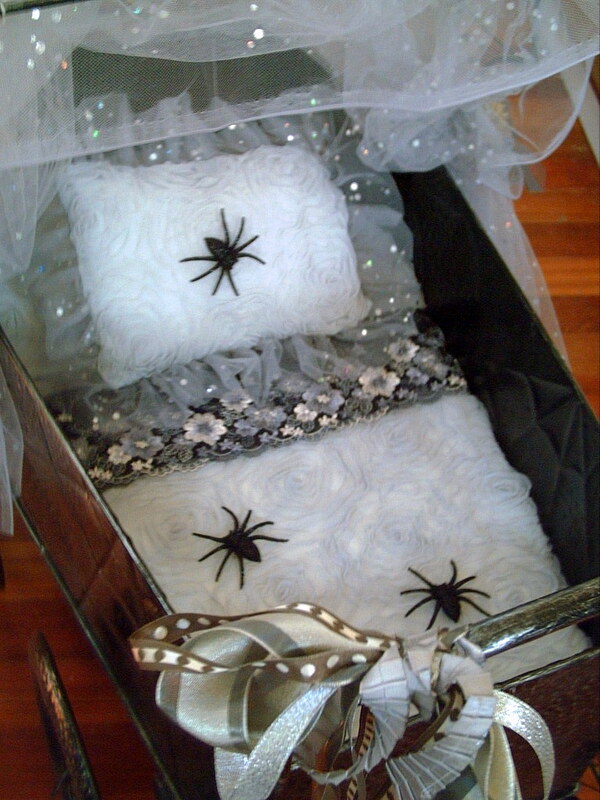 And... there so happens to be another spider crawling down the ruffled pillow! Adding ribbons on each side of the handle. And... an adorable cat skeleton sitting on top of the hood. 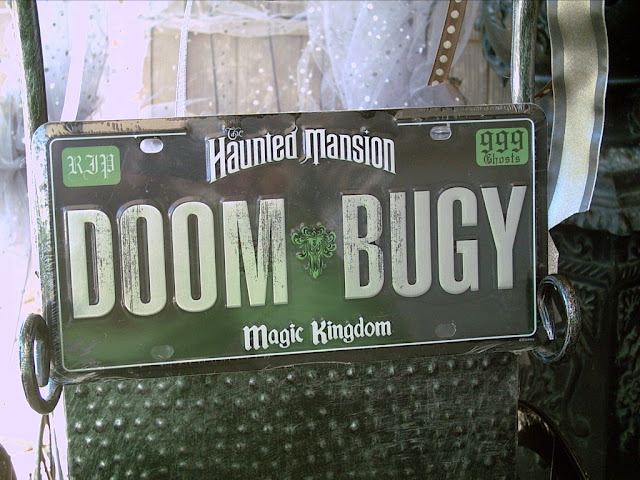 One of my favorite things is the license plate, "Doom Bugy". 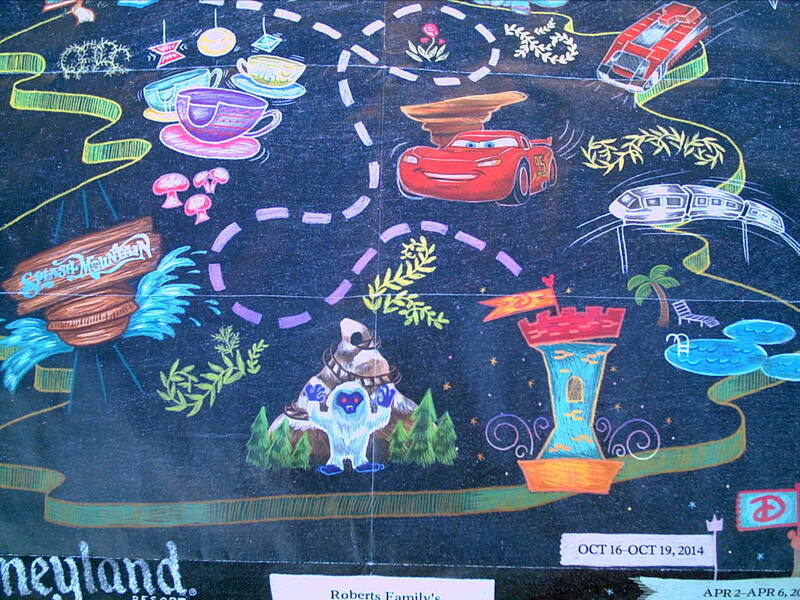 Sold at Disney World or Disneyland. They were always sold out, when I tried to purchase at the parks or online. This one I bought on Ebay. It so happens that the seller lived 10 miles from me. We met up and she sold it to me for a great lower price than she had it on Ebay for, plus no shipping charge. Next year I want to dress up a skeleton in a Victorian style of dress and have her pushing the empty carriage. 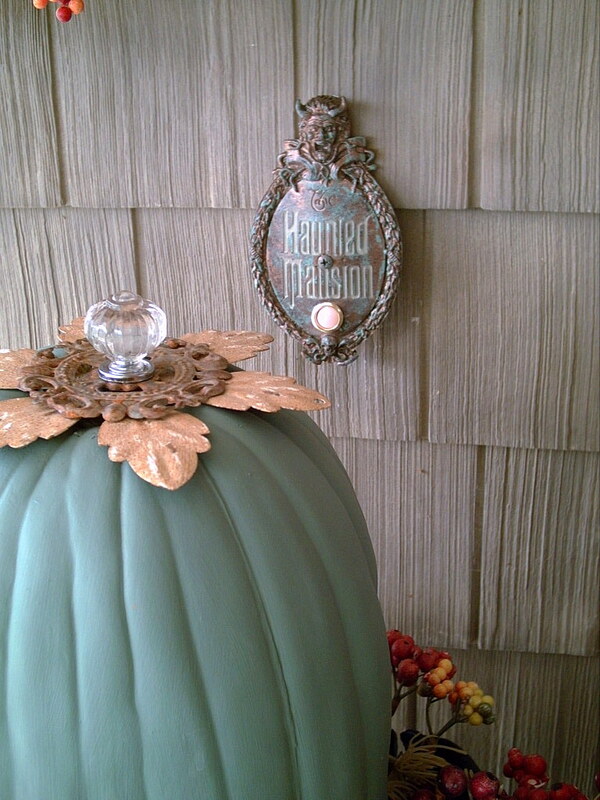 We also change out our doorbell each year for the months of September and October. 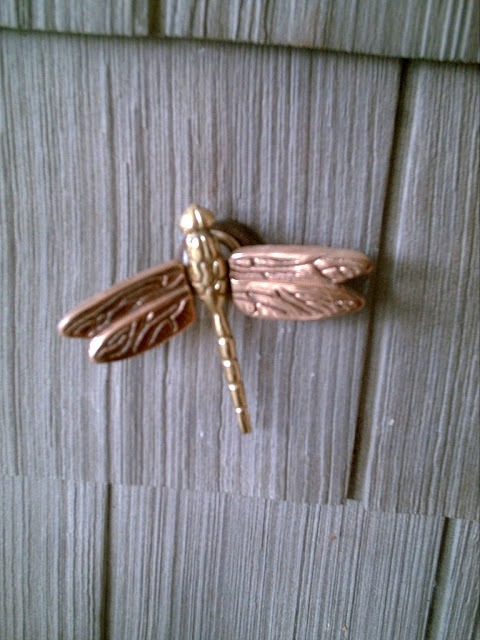 What we have for the other ten months is a brass and copper Dragonfly. Just press the dragonfly and the doorbell rings. 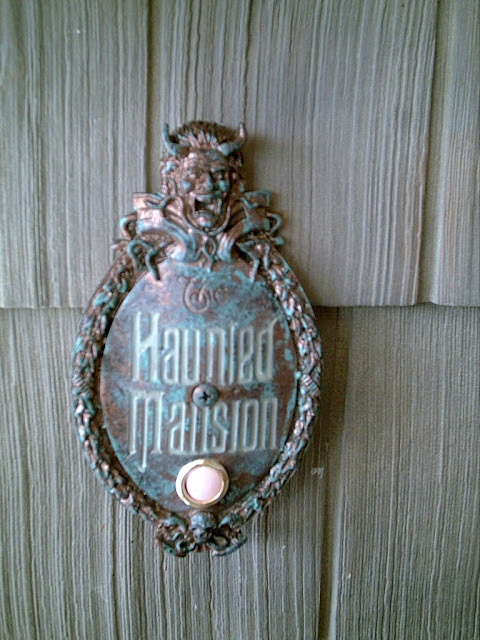 For our outdoor Halloween decor we use a replica of the Disney Haunted Mansion doorbell. It is so fun, it stays lit. 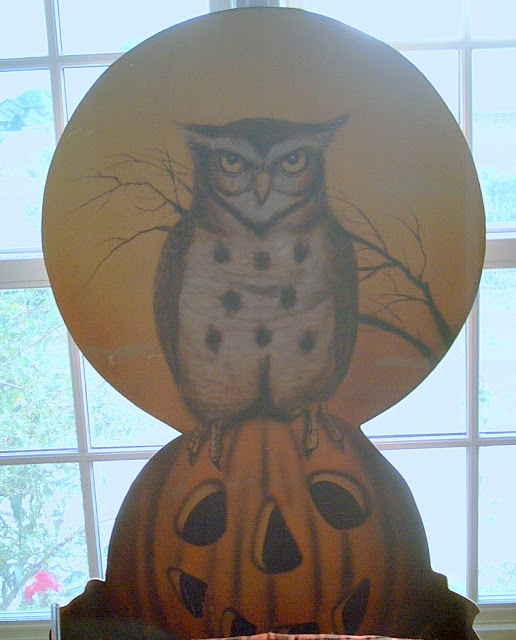 The pumpkin I painted with chalk paint. 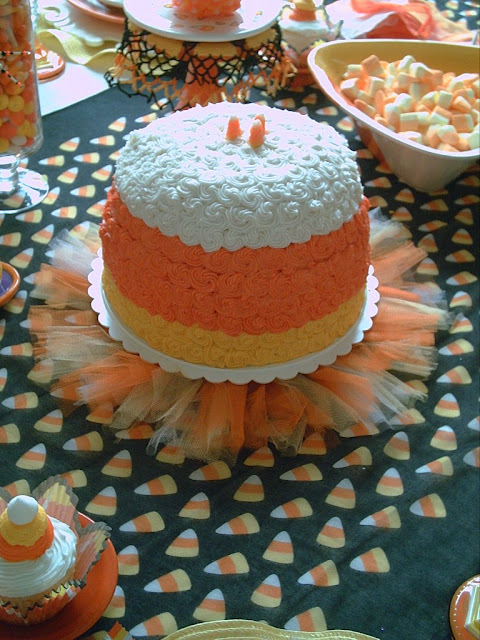 I love pumpkins and do all kinds of things with them. If I don't like the stem I cut it off and replace with something else. This pumpkin has a Christmas ornament on top. I think it fits so well as a new pumpkin stem with leaves. I will be posting on Metamorphosis Monday at Between Naps on the Porch. I love comments, please leave one. Thank you.